Donald Trump's economic plans are suddenly getting gold stars on Wall Street. Big banks such as Bank of America (BAC), UBS (UBS) and HSBC (HSBC) are bumping up their predictions for U.S. growth and stock market gains. The reason? Trumponomics. 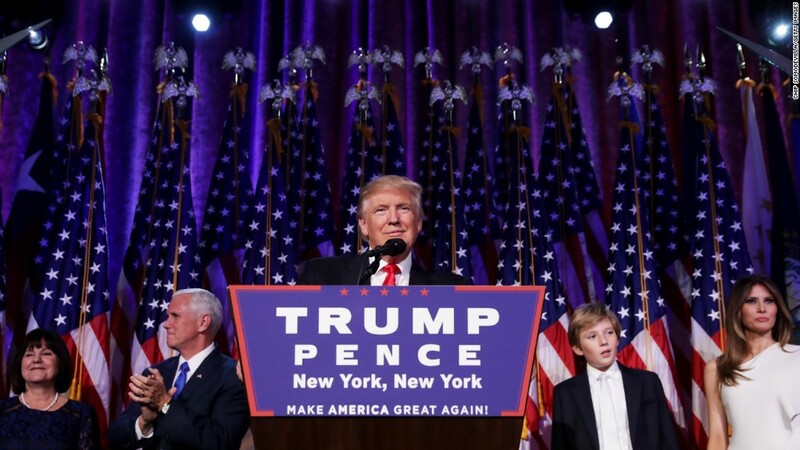 "Following Donald Trump's election victory, we have altered our GDP forecasts as we are now expecting a modest fiscal stimulus from lower tax rates and higher government spending," wrote HSBC chief U.S. economist Kevin Logan in a recent report. It's a stunning reversal from the days before the election when economists and market experts at many Wall Street banks were forecasting dire consequences -- a recession and a swift market drop -- if Trump were elected president. Now many are saying the opposite: Trump is good for growth. "Well-executed U.S. fiscal policy could boost growth substantially," says Don Rissmiller of investment firm Strategas. Rissmiller predicts GDP growth could be a full 1% higher in 2017 and 2018. The U.S. has been expanding at a pace of about 2% a year. Trump vows to get America to 4%. The stock market has surged to record levels after Trump's election. Investors cheered his promises of massive tax cuts for individuals and businesses, a rollback on onerous regulations and up to $1 trillion of new government spending on roads, bridges and other infrastructure. The Dow is up over 5% this month, and comes after three months of losses. "The market has sailed through some of this year's biggest shocks (U.K. Referendum, U.S. election)," wrote the Bank of America Merrill Lynch team in a recent report. The team raised its forecast for the S&P 500 index to end the year at 2,100, up from 2,000. On top of the tax cuts, investors also like the idea of giving big businesses like Apple (AAPL) a tax discount to bring the cash they have stashed overseas back to the United States. That money coming back could be spent on companies buying up more stock, which would further boost prices. But Wall Steet's newfound love for Trumponomics comes with a big asterisk: Trump can't get too protectionist on trade and immigration. Wells Fargo (WFC) put it this way: "Tax cuts and additional federal spending could stimulate economic growth, but tariffs and restricting immigration may slow the economy. These policy prospects create potentially offsetting effects." Due to the trade concerns, Wells Fargo hasn't hiked its GDP forecast. However it does expect higher inflation. Mitt Romney -- now under consideration to be Trump's Secretary of State pick -- was one of many business leaders who slammed Trump for his plans to place hefty taxes on Mexican and Chinese goods coming into the U.S. Romney even said Trump's trade ideas would send the nation careening into a recession. Trump's plan for his first 100 days in office includes "renegotiating" or "withdrawing" from NAFTA and labeling China a "currency manipulator." It's unclear how far he will go. Bank of America Merrill Lynch: "Our 2016 year-end target shifts to 2,100 from 2,000 previously." HSBC: We are raising our GDP forecast for 2017 to 2.3% from 2.1% in anticipation of a boost to consumption spending. The stimulus effect should be larger in 2018 as the full impact of tax cuts affects household finances. We forecast GDP growth in 2018 to average 2.7%, up from our previous forecast of 2.2%." UBS: "U.S. GDP is likely to accelerate next year...A new fiscal policy regime -- corporate and household income tax cuts -- may further contribute to broader GDP growth although there's obviously uncertainty around new policy as well as an important drag from uncertainty around trade policy." Capital Economics: "We now expect GDP growth to accelerate to 2.75% next year (up from 2%), with CPI inflation climbing toward 3%." Yardeni Research: "In Trump World, pressure on profits could be very bullish for stocks thanks to over $2 trillion in repatriated cash and a significant cut in the corporate tax rate! That's a new reality for sure." Strategas: "A key message of the market recently has been: Something is going to get done. Single-party government matters. It is possible that well-executed U.S. fiscal policy could boost growth substantially (1%+ on GDP) in 2017-18. Corporate earnings should benefit."